Don't let the maybe annoying distraction take away from the benefits of hemp seed oil as an effective beauty ingredient-legally derived from the multi-asking industrial hemp plant. (FYI-the industrial hemp plant spawns rope + fabric both super popular for decades too). Derived from the non-or practically non-THC (buzz part) strain of the cannabis sativa plant (for the 411 on hemp seed oil and CBD oil read our clip on what it REALLY is- Part One)...the benefits of hemp seed oil-marketed as the maybe sexier sounding cannabis sativa oil are front /center now-the way other plant oils are-think coconut and argan-for beauty/skin/haircare products. No longer hippy centric-and now mainstream...expect to see loads of new products-with hemp seed oil's moisturizing-nourishing benefits of soothing polyunsaturated essential fatty acids, omega's 3-6-9, 20 amino acids etc. IMO-not relaxing per se-like inhaling ha ha ha...but expect to see that RELAXING adjective tossed around a lot...when it comes to describing hemp seed oil beauty products. HIGH™BEAUTY makes two really nice vegan, cruelty free-made from cold pressed hemp seed oil products (impressive=20% or 32%)- available online at Sephora's. 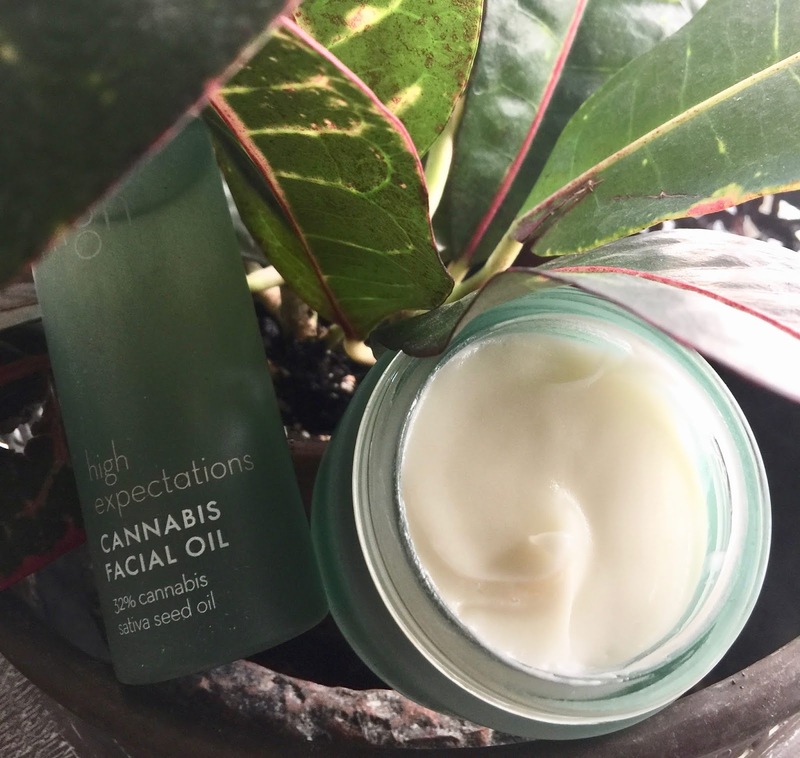 Adhering to CLEAN at Sephora™(see below) ...the high five Cannabis Facial Moisturizer $40-creamy whipped texture and super lightweight Cannabis Facial Oil---are now gym bag staples. Both are suitable for dry, normal, combo, sensitive skin...and even oily skin might give it a try in spots-esp the facial oil- skip the T-zone-and use on one's neck, around the eyes, etc. The moisturizer has loads of other healing skin boosting-anti-oxidants, cell nurturing ingredients too- including aloe vera, grape seed oil, jojoba, shea butter and milk thistle. A little goes a long way-a dab or a dollop-depending on how dry skin is. Indulge a bit-and used as a hand moisturizer-it's a savior without smudging up our smartphone screen-it absorbs that quickly! The facial oil -with highest hemp seed oil concentration -is non-greasy, super fast absorbing. Post swim shower, we put a few drops on our palms and press on our chemically stressed skin...and wait a few seconds for it to sink in. What ever redness we might have courtesy of a public pool-def eases away. No stinging either-around the eyes-a problem we have we a lot of targeted eye creams. AND: Kudos to packaging ...as the High Beauty facial oil has a dose specific stopper that we wish other companies would use, Just saying. Lightweight really hydrating mash-up of the brand's acclaimed argan oil collection with organic hemp seed oil-multitasks as a cleanser or moisturizer... just 2-4 drops swirled over face...is absorbed fairly quickly. Good for normal-dry sensitive skin...adds a glow, can improve parched skin texture-nice during winter's dryer environments. Another hemp blessed product found on Maran's new www.skindope.com website, which oddly enough-like alcohol-has that +18 question before clicking along...is the Argan+CBD MG Oil $78...made from the same organic argan oil and with CBD oil made from the non-buzzy hemp plant- extracted but unlike hemp seed oil-comes from other parts of that plant (flowers, leaves, stalks) -hence the pricier cost. Like the CBD Plus products reviewed in Part 2, Maran's CBD oil is extracted via CO2 extraction. Insta-acting, it's a real skin soother naturally blessed with acclaimed anti-inflammatory properties...heavier than the aforementioned product tho-so a little goes a long way and maybe oily skin wouldn't use this on the face. Notably (several reviews posted)... her CBD Oil loaded product smells okay too. Dab on minor scrapes, scaly skin patches that seem to crop up, and those deep heel cracks from extreme parched dermis-too. FYI: Model -activist -entrepreneur Josie Maran's been touting organic and botanical green leaning cosmetics and skincare for years. Vegan, cruelty free and FREE of sulfate, paraben, gluten, PHT, synthetic fragrance, mineral oil, PEG, formaldehyde. Origins-owned by giant Estée Lauder-also is jumping into the hemp band wagon with it's new Hello, Calm™ Face Mask with hemp seed oil. (Not tried-priced at $28). Kiehl's now L'Oreal owned-launched a hemp seed oil -labelled cannabis sativa oil line too. PS: Want (expect) cruelty free options...? Here's a great list of some name brand still animal torturer testers...and better alternatives -upscale and value brands.